Can I use same licence on the desktop and laptot? If you want to use Goalscape on multiple machines (and access the latest versions of all your projects, whatever machine you use), the ideal solution is to use the web application Goalscape Online. You currently have a Goalscape Online Free account, which means you can create 1 project (30 goals maximum) and share it with others. With an Online Unlimited subscription you can create an unlimited number of projects of unlimited size – and even give Free users Edit access to large projects (1 per Free user). You can also access your Online projects using the free Goalscape Mobile app (for all Android and iOS phones and tablets): it syncs with Goalscape Online to display your projects and goals in an indented text hierarchy (like the Goal List in the main application). Goalscape Desktop is standalone desktop software: it does not sync with Goalscape Online or Goalscape Mobile or across platforms. It is sold under a single-user lifetime license, which allows you to install and activate the software on one machine at a time: when you activate it on any computer, your previous installation will be deactivated. So you could install Goalscape Desktop on both your desktop and laptop computer under a single license; you would though need to (re)activate it every time you switch machines. Or you could purchase 2 licenses (under different email addresses). Either way though, you would need to share your Desktop projects (.gsp files) between machines on a memory stick, or by email or via a third-party filesharing facility (like Dropbox) – and you would need to do your own version control. For these reasons we recommend Goalscape Online for use on multiple machines. Thank you for so detailed reply. Yes: you could buy 2 Goalscape Desktop licenses (under different email addresses as usernames) and install and activate the software on both your machines. When you share files with yourself via Dropbox, email, or on a memory stick you will still though need to pay some attention to version control: even if you do not share your projects with anyone else, you will need to ensure that you are always working on the latest versions of those projects (wherever they are saved and whichever machine you are using). There is already a Russian version of Goalscape – you can select that option in Settings (click the 'cog' button at top right to open the Settings screen). When you have selected a locale, any unknown words in text fields will be indicated by red 'squiggly' underlining (Spelling is enabled by default). 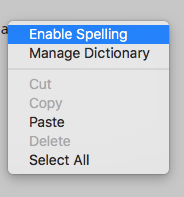 You can right-click any such word and correct it or add your version to the Dictionary. 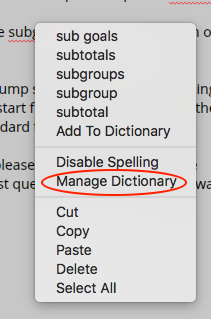 You can also right-click in any text field (goal names or Notes) and select 'Manage Dictionary' to add new words. If you have Disabled Spelling you will need to right-click in any text field and Enable it. See the attached screenshots. Is it possible to have Russian spelling check and English interface? Can you tell, do you plan to add Google cal sync in desktop/web? I saw the forum discussion about it since 2010. Can I see the roadmap for desktop/web? The locale selection applies to the interface (button labels, messages, etc) and to the spelling dictionary for text input fields. We may indeed integrate Goalscape with third-party tools like Google Calendar at some point; we cannot however indicate any delivery date. Note that you can already use the hyperlink facility (in goal Notes and Comments) to link goals to Events in online Calendars. You may also be interested in Emmett Lazich's blog article Getting Things Done – with or without Dates. Goalscape Software uses agile development to allow us to respond fast to urgent requests or important new initiatives (recent examples include Goal List and Goal Path, both of which were built, tested and delivered within 2 weeks). Our development roadmap is therefore necessarily flexible and we do not publish it – or announce new features until we are ready to deliver them. I can however tell you that our plans for 2018 include a captive runtime version of Goalscape Desktop (that will make it completely independent of the local AIR environment) and some useful enhancements to the UI. What is it goal pass btw? Sorry, I do not understand the question. Where have you seen the phrase "goal pass"? Is it in the software or on our website? If you can send a screenshot it would be very helpful. Goal Path is the 'breadcrumbs' style display (in the panel header, below the goal name) of the selected goal's location in the project (in the form [parent goal name] > [grandparent goal name] > ... > [main goal name]). See the attached screenshot. 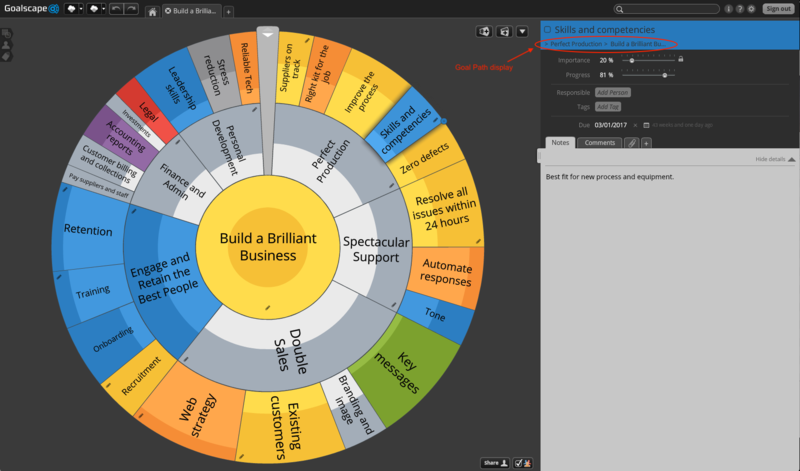 This allows you to see at a glance where you are in a very large project, even if the selected goal is very small and at an outer level and you cannot see the highlighting clearly. Note that you can also use the 'Focus [View] On Parent Goal' option in the Goal Edit drop-down or the right-click menu to 'zoom in' on a particular area of the project (in Focus View there is a miniature at top left to show where the Focused area is in the overall project). С новым годом – may you achieve great goals in 2018! Richard Parslow closed this discussion on 28 Dec, 2017 01:40 PM.